Hope Softplan doesn't forget or does the changes to give softlist the ability to edit Items and create a way so softlist isn't live, so it won't regenerate when you don't want it to otherwise editing it does no good. I think it would be cool to throw the old softlist back in and name it, ? let's see, something else? So guys like me can continue to work, without going back and redoing everything so we can use softlist. I can maybe see working up to dealing with the new live softlist, but not being prepared to see this major change in softlist take place, it will take weeks to get things to put out a usable list as is. I don't really have weeks to fix details. Again just want to keep this concern up there, in hopes a change will take place. I'm doing a list tonight, will take a little time and I will have to remember to save it as an excel, so I don't loss the changes and info. I'm thinking I can't turn the list I'm working on now , off until I finish and save to excel. seems on the project when you change the cost on the formula, it stays put when you close and reopen the same material list. This is nice, would be ever nicer for now if we could right click and go straight to accounting to adjust pricing. I'm also keeping my fingers crossed that SoftList reverts back to the old way of being able to edit items in a report without having to resort to exporting to Excel spreadsheet. Until this happens, I'll have to stick with 2016. It's just too much work to create a perfect 3d model to create a perfect (uneditable ) SoftList report. I'm beginning to think that there aren't that many SoftList users out there due to the lack of feedback on this new "Live" reporting issue. Anyone else out there have concerns about how SoftList works in 2018? Can't say that I use it. I had spent a lot of time on it when I started in version 8 but it was to restrictive back then. I'm always considering that I should get back into it but presently, based on feedback, will hold off on it. If you're still using 2016, SoftList works great. I couldn't do my job without it! I see the last postings here were in April of 2017. Have any of the Advanced members on this thread converted to 2018 yet? I ask because I finally gained the courage to download 2018 version . I copied a test project from 2016 to use as a sacrificial project to open in the new 2018 version. Well....i am glad I did. I restored my report styles from 2016 and all transferred well. When I ran my first 2018 report, I had 79 "output errors". Needless to say panic immediately set in! As wonderful as SP support is, I can't for the life of me figure out the fix. I was hoping to get some advice here. Any advice at this point would be very much appreciated. I've been using SoftPlan & SoftList 2018 for over 8 months now and I am thrilled with the way SoftList live reports work. I initially was concerned about the always updating of the report, but came to realize that was the best feature. 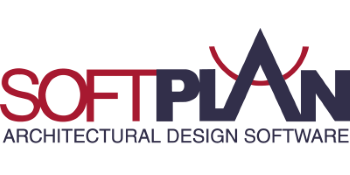 Lets say you are working on a SoftList report and decide to change a wall from a 2x4 to 2x6. In the past you would have to rerun the entire list and retweak any corrections or adjustment you had made to the original report. Now a soon as the edit to the wall is made the list is instantly updated to reflect 2x6 plates, shoes, studs, etc. I cannot imagine going back to the old way of running SoftList. BTW if you need to capture a snapshot of the SoftList report at any given time, just print it to pdf and save it with an appropriate name. Can you attach a screenshot of your output errors so we can help? I agree with you completely!. I had the opportunity to dive into the softlist reports this weekend in 2018 and really like the softlist set up. Utilizing two monitors, it makes it that much more friendly. I must say though, I am still a little green on how to save new symbols or formulas in both the project and system configuration. I suppose it will all come with time. Trial and error. - Do you find that when you have your report open in a split screen that your drawing seems to lag behind. In other words, when I have my report open on one monitor and my plan open on another monitor the creation of walls or lines seem to be not so lagging. - When in my report, if I go to layout, my libraries and materials bar appear on the right side of the screen ( most are greyed out). There are several categories shown in black that are collapsed ( i.e. CONCRETE BLOCK, BEAMS, ETC.). There are times when I am not able to open the categories beyond BEAMS as the expanding "+" is missing to expand. Have you ever had that experience? - I am trying to write a proper procedure on what I must do to keep my main "System Configuration" current. Once I add a symbol or formula, and it calculates correctly with no output errors on my project drawing, I go to my layout and place it in the proper location and all is calculating correctly, do I then go to project options, report configurations, "Add to System" and then go into System Options, find what I just saved there and move it where needed as well. I am doing this task twice correct? Once for project and once for system? 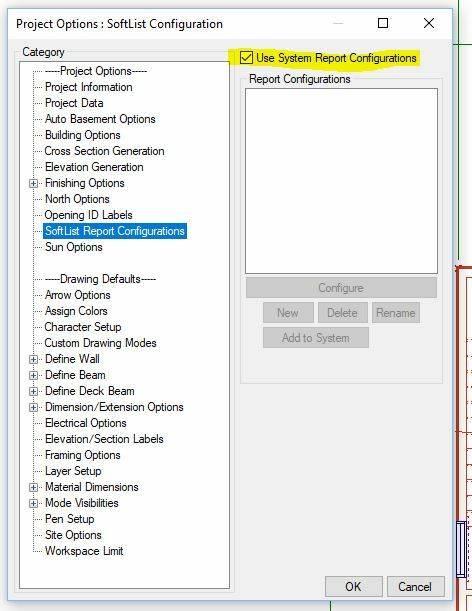 For my situation I do not want customized report configurations for each project. I only want to manage one configuration for all projects that I design. 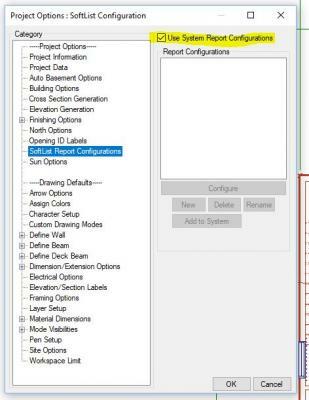 To do that you need to enable the "Use System Report Configuations" in the Project Options. I do notice a slight delay when I am drawing or editing a project with a SoftList report active. In some cases there is a lot of computations going on to the report when you make a change. if this become unbearable, just close out the report until you're done with all your design/ edits and then rerun the report. None of your edits or changes to the initial report will be lost. Not sure about your + sign being missing in your Layout mode. All I can figure is that there are no sub items in that category hence no = sign. That makes perfect sense to me. My approach is exactly the same with every project. I believe working from my System Report Configuration as you do will make things less complicated. Maybe in the future once I am more familiar with 2018, I my play around with "by floors" and so on. As for the missing "+", I believe it must have been some type of quirk in the system. I have not experienced that situation since. I had a lot of things going on and most likely clicked when too many times and the system didn't like it. Hey Phillip thanks for reaching out to me and answering some of my questions. I remember the hours and hours it took me to set up 2016 the way I liked it. Making the change to 2018 without understanding how to get softlist to operate the way I was used too was and still is somewhat overwhelming. I do feel better about it all today than I did 5 days ago! Whew! Softlist ( to me!) is as important if not more important than the drawing program itself. To temporarily loose control and not have an understanding of how to fix it immediately can give you an ulcer!.....and I don't need anymore ulcers! Again thanks for your help. You can bet I will be calling on you again for some direction! I totally agree with you Myron. I couldn't do my job without SoftList. I also went through some serious anxiety when I switched over to SoftList 2018, but am now 100% sold on the "Live" reports. It's the most significant improvement to SoftList in the 9 years I've been using SoftPlan. BTW in addition to "By Floor", have you tried experimented with User Defined Variables? That's another powerful feature of SoftList. I have not yet updated my system at my office. I want to work out a few formula bugs before I archive and implement on my office system. I am trying to write a formula to convert all my sub fascia, rims joists, etc into single pieces rather than total linear ft. Once I have that figured out, I will fall back to a formula that was posted a while back that will count all my wall materials such as jacks, sills, cripples and convert them o precut sizes. This will be most helpful in the field as those guys don't take the time to utilize the lumber as it is intended. They grab a precut and cut jacks, another precut and cut sills and so on. I copied the formula EXACTLY how it was presented but for the life of me I cannot get it to work. I will post the formula or link if you think you might have an interest in using it. As for the "By Floor", I have never set it up before but feel it could be a real helpful report when ordering lumber or doing a cost comparison to the lumber yard quotes. On another note, and after several requests to SP tech, I would like to figure out a way to calculate a mark up on my labor as well as materials. Softlist only gives us the option to add markup on materials but not labor. In my world, we markup the overall cost of the project (Labor and materials) I would also like to add additional costs BELOW the total line. Costs that are added to the overall project cost but are not calculated in the direct job cost. As it stands today, I have to input my Softlist information into an excel spreadsheet to get my overall costs as Softlist does not give me enough customization options to be a complete estimating system. I would like to hear your thoughts on that Phil! I know this is an old post but with a new Design/Build company I am find the same think with regards to total markup (material and labor). Has anyone found away to do this? Currently I am creating another section in the taxes and calling it mark-up so that I can add that to labor.